5. We can fix it (see the World Cafe teaching activity I started fall 2014). 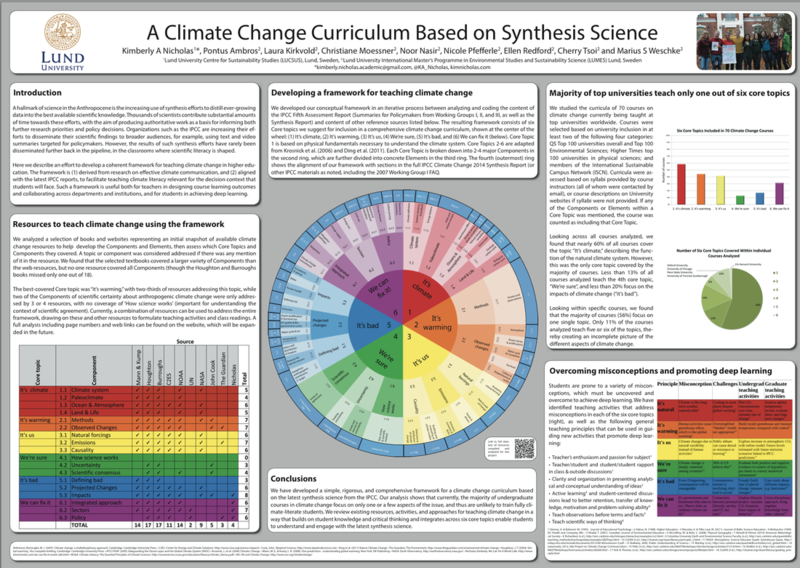 An Open-Source Climate Change Curriculum for University Education Based on IPCC Synthesis Science by Kimberly A Nicholas, Pontus Ambros, Laura Kirkvold, Christiane Moessner, Noor Nasir, Nicole Pfefferle, Ellen Redford, Cherry Tsoi, and Marius S Weshke is licensed under a Creative Commons Attribution-ShareAlike 4.0 International License. Permissions beyond the scope of this license may be available at http://www.kimnicholas.com/. We presented our results at the Our Common Future Under Climate Change meeting in Paris in July 2015, including an analysis of the alignment of the IPCC Synthesis Report with this framework, how the focus of the IPCC has evolved over time, how existing international courses reflect the focus of the IPCC. ​I worked with a larger team to prepare our initial findings, which I presented at the American Geophysical Union Fall Meeting on 15 December 2014. You can click here for a full-resolution copy of our poster. You are welcome to use this for teaching or other non-commercial use with attribution (please cite Nicholas et al., 2014, and link to this web page). Feedback welcome! The Climate Change Curriculum team: (L-R) LUMES students Nicole Pfefferle, Pontus Ambros, Noor Nasir, Marius Weschke, Cherry Tsoi, Ellen Redford, Laura Kirkvold, Christiane Moessner, and Prof. Kim Nicholas. Here you'll find links to the underlying data used to create our AGU poster. These are a work in progress; please get in touch with questions or corrections! We would especially like to hear from professors who have used or modified this curriculum in teaching, or students who have been taught from this curriculum, but all comments are welcome.